This article is about the microorganisms. For the genus, see Bacillus. For other uses, see Bacteria (disambiguation). The bacteria ( [bÃ¦kËˆtÉï¿½Éï¿½riÉï¿½] (help–info); singular: bacterium)[îï¿½] are a large group of single-celled, prokaryote microorganisms. Typically a few micrometres in length, bacteria have a wide range of shapes, ranging from spheres to rods and spirals. Bacteria are ubiquitous in every habitat on Earth, growing in soil, acidic hot springs, radioactive waste, water, and deep in the Earth's crust, as well as in organic matter and the live bodies of plants and animals. There are typically 40 million bacterial cells in a gram of soil and a million bacterial cells in a millilitre of fresh water; in all, there are approximately five nonillion (5Ã—1030) bacteria on Earth, forming much of the world's biomass. Bacteria are vital in recycling nutrients, with many steps in nutrient cycles depending on these organisms, such as the fixation of nitrogen from the atmosphere and putrefaction. However, most bacteria have not been characterized, and only about half of the phyla of bacteria have species that can be grown in the laboratory. The study of bacteria is known as bacteriology, a branch of microbiology. Bacteria were first observed by Antonie van Leeuwenhoek in 1676, using a single-lens microscope of his own design. He called them "animalcules" and published his observations in a series of letters to the Royal Society. The name bacterium was introduced much later, by Christian Gottfried Ehrenberg in 1838. Louis Pasteur demonstrated in 1859 that the fermentation process is caused by the growth of microorganisms, and that this growth is not due to spontaneous generation. (Yeasts and molds, commonly associated with fermentation, are not bacteria, but rather fungi.) Along with his contemporary, Robert Koch, Pasteur was an early advocate of the germ theory of disease. Robert Koch was a pioneer in medical microbiology and worked on cholera, anthrax and tuberculosis. In his research into tuberculosis, Koch finally proved the germ theory, for which he was awarded a Nobel Prize in 1905. In Koch's postulates, he set out criteria to test if an organism is the cause of a disease, and these postulates are still used today. Though it was known in the nineteenth century that bacteria are the cause of many diseases, no effective antibacterial treatments were available. In 1910, Paul Ehrlich developed the first antibiotic, by changing dyes that selectively stained Treponema pallidum'the spirochaete that causes syphilis'into compounds that selectively killed the pathogen. Ehrlich had been awarded a 1908 Nobel Prize for his work on immunology, and pioneered the use of stains to detect and identify bacteria, with his work being the basis of the Gram stain and the Ziehl-Neelsen stain. A major step forward in the study of bacteria was the recognition in 1977 by Carl Woese that archaea have a separate line of evolutionary descent from bacteria. This new phylogenetic taxonomy was based on the sequencing of 16S ribosomal RNA, and divided prokaryotes into two evolutionary domains, as part of the three-domain system. The ancestors of modern bacteria were single-celled microorganisms that were the first forms of life to appear on Earth, about 4 billion years ago. For about 3 billion years, all organisms were microscopic, and bacteria and archaea were the dominant forms of life. Although bacterial fossils exist, such as stromatolites, their lack of distinctive morphology prevents them from being used to examine the history of bacterial evolution, or to date the time of origin of a particular bacterial species. However, gene sequences can be used to reconstruct the bacterial phylogeny, and these studies indicate that bacteria diverged first from the archaeal/eukaryotic lineage. The most recent common ancestor of bacteria and archaea was probably a hyperthermophile that lived about 2.5 billion'3.2 billion years ago. Bacteria were also involved in the second great evolutionary divergence, that of the archaea and eukaryotes. Here, eukaryotes resulted from ancient bacteria entering into endosymbiotic associations with the ancestors of eukaryotic cells, which were themselves possibly related to the Archaea. This involved the engulfment by proto-eukaryotic cells of alpha-proteobacterial symbionts to form either mitochondria or hydrogenosomes, which are still found in all known Eukarya (sometimes in highly reduced form, e.g. in ancient "amitochondrial" protozoa). Later on, some eukaryotes that already contained mitochondria also engulfed cyanobacterial-like organisms. This led to the formation of chloroplasts in algae and plants. There are also some algae that originated from even later endosymbiotic events. Here, eukaryotes engulfed a eukaryotic algae that developed into a "second-generation" plastid. This is known as secondary endosymbiosis. Bacteria display a wide diversity of shapes and sizes, called morphologies. Bacterial cells are about one tenth the size of eukaryotic cells and are typically 0.5'5.0 micrometres in length. However, a few species'for example Thiomargarita namibiensis and Epulopiscium fishelsoni'are up to half a millimetre long and are visible to the unaided eye. Among the smallest bacteria are members of the genus Mycoplasma, which measure only 0.3 micrometres, as small as the largest viruses. Some bacteria may be even smaller, but these ultramicrobacteria are not well-studied. Most bacterial species are either spherical, called cocci (sing. coccus, from Greek îï¿½ÏŒîï¿½îï¿½î¿Ï‚-kÃ³kkos, grain, seed) or rod-shaped, called bacilli (sing. bacillus, from Latin baculus, stick). Elongation is associated with swimming. Some rod-shaped bacteria, called vibrio, are slightly curved or comma-shaped; others, can be spiral-shaped, called spirilla, or tightly coiled, called spirochaetes. A small number of species even have tetrahedral or cuboidal shapes. More recently, bacteria were discovered deep under the Earth's crust that grow as long rods with a star-shaped cross-section. The large surface area to volume ratio of this morphology may give these bacteria an advantage in nutrient-poor environments. This wide variety of shapes is determined by the bacterial cell wall and cytoskeleton, and is important because it can influence the ability of bacteria to acquire nutrients, attach to surfaces, swim through liquids and escape predators. Many bacterial species exist simply as single cells, others associate in characteristic patterns: Neisseria form diploids (pairs), Streptococcus form chains, and Staphylococcus group together in "bunch of grapes" clusters. Bacteria can also be elongated to form filaments, for example the Actinobacteria. Filamentous bacteria are often surrounded by a sheath that contains many individual cells. Certain types, such as species of the genus Nocardia, even form complex, branched filaments, similar in appearance to fungal mycelia. Bacteria often attach to surfaces and form dense aggregations called biofilms or bacterial mats. These films can range from a few micrometers in thickness to up to half a meter in depth, and may contain multiple species of bacteria, protists and archaea. Bacteria living in biofilms display a complex arrangement of cells and extracellular components, forming secondary structures such as microcolonies, through which there are networks of channels to enable better diffusion of nutrients. In natural environments, such as soil or the surfaces of plants, the majority of bacteria are bound to surfaces in biofilms. Biofilms are also important in medicine, as these structures are often present during chronic bacterial infections or in infections of implanted medical devices, and bacteria protected within biofilms are much harder to kill than individual isolated bacteria. Even more complex morphological changes are sometimes possible. For example, when starved of amino acids, Myxobacteria detect surrounding cells in a process known as quorum sensing, migrate towards each other, and aggregate to form fruiting bodies up to 500 micrometres long and containing approximately 100,000 bacterial cells. In these fruiting bodies, the bacteria perform separate tasks; this type of cooperation is a simple type of multicellular organisation. For example, about one in 10 cells migrate to the top of these fruiting bodies and differentiate into a specialised dormant state called myxospores, which are more resistant to drying and other adverse environmental conditions than are ordinary cells. The bacterial cell is surrounded by a lipid membrane, or cell membrane, which encloses the contents of the cell and acts as a barrier to hold nutrients, proteins and other essential components of the cytoplasm within the cell. As they are prokaryotes, bacteria do not tend to have membrane-bound organelles in their cytoplasm and thus contain few large intracellular structures. They consequently lack a nucleus, mitochondria, chloroplasts and the other organelles present in eukaryotic cells, such as the Golgi apparatus and endoplasmic reticulum. Bacteria were once seen as simple bags of cytoplasm, but elements such as prokaryotic cytoskeleton, and the localization of proteins to specific locations within the cytoplasm have been found to show levels of complexity. These subcellular compartments have been called "bacterial hyperstructures". Micro-compartments such as carboxysome provides a further level of organization, which are compartments within bacteria that are surrounded by polyhedral protein shells, rather than by lipid membranes. These "polyhedral organelles" localize and compartmentalize bacterial metabolism, a function performed by the membrane-bound organelles in eukaryotes. Many important biochemical reactions, such as energy generation, occur by concentration gradients across membranes, a potential difference also found in a battery. The general lack of internal membranes in bacteria means reactions such as electron transport occur across the cell membrane between the cytoplasm and the periplasmic space. However, in many photosynthetic bacteria the plasma membrane is highly folded and fills most of the cell with layers of light-gathering membrane. These light-gathering complexes may even form lipid-enclosed structures called chlorosomes in green sulfur bacteria. Other proteins import nutrients across the cell membrane, or to expel undesired molecules from the cytoplasm. Carboxysomes are protein-enclosed bacterial organelles. Top left is an electron microscope image of carboxysomes in Halothiobacillus neapolitanus, below is an image of purified carboxysomes. On the right is a model of their structure. Scale bars are 100 nm. Bacteria do not have a membrane-bound nucleus, and their genetic material is typically a single circular chromosome located in the cytoplasm in an irregularly shaped body called the nucleoid. The nucleoid contains the chromosome with associated proteins and RNA. The order Planctomycetes are an exception to the general absence of internal membranes in bacteria, because they have a membrane around their nucleoid and contain other membrane-bound cellular structures. Like all living organisms, bacteria contain ribosomes for the production of proteins, but the structure of the bacterial ribosome is different from those of eukaryotes and Archaea. Some bacteria produce intracellular nutrient storage granules, such as glycogen, polyphosphate, sulfur or polyhydroxyalkanoates. These granules enable bacteria to store compounds for later use. Certain bacterial species, such as the photosynthetic Cyanobacteria, produce internal gas vesicles, which they use to regulate their buoyancy - allowing them to move up or down into water layers with different light intensities and nutrient levels. Around the outside of the cell membrane is the bacterial cell wall. Bacterial cell walls are made of peptidoglycan (called murein in older sources), which is made from polysaccharide chains cross-linked by unusual peptides containing D-amino acids. Bacterial cell walls are different from the cell walls of plants and fungi, which are made of cellulose and chitin, respectively. The cell wall of bacteria is also distinct from that of Archaea, which do not contain peptidoglycan. The cell wall is essential to the survival of many bacteria, and the antibiotic penicillin is able to kill bacteria by inhibiting a step in the synthesis of peptidoglycan. Gram-positive bacteria possess a thick cell wall containing many layers of peptidoglycan and teichoic acids. In contrast, Gram-negative bacteria have a relatively thin cell wall consisting of a few layers of peptidoglycan surrounded by a second lipid membrane containing lipopolysaccharides and lipoproteins. Most bacteria have the Gram-negative cell wall, and only the Firmicutes and Actinobacteria (previously known as the low G+C and high G+C Gram-positive bacteria, respectively) have the alternative Gram-positive arrangement. These differences in structure can produce differences in antibiotic susceptibility; for instance, vancomycin can kill only Gram-positive bacteria and is ineffective against Gram-negative pathogens, such as Haemophilus influenzae or Pseudomonas aeruginosa. In many bacteria an S-layer of rigidly arrayed protein molecules covers the outside of the cell. This layer provides chemical and physical protection for the cell surface and can act as a macromolecular diffusion barrier. S-layers have diverse but mostly poorly understood functions, but are known to act as virulence factors in Campylobacter and contain surface enzymes in Bacillus stearothermophilus. Fimbriae are fine filaments of protein, just 2'10 nanometres in diameter and up to several micrometers in length. They are distributed over the surface of the cell, and resemble fine hairs when seen under the electron microscope. Fimbriae are believed to be involved in attachment to solid surfaces or to other cells and are essential for the virulence of some bacterial pathogens. Pili (sing. pilus) are cellular appendages, slightly larger than fimbriae, that can transfer genetic material between bacterial cells in a process called conjugation (see bacterial genetics, below). Capsules or slime layers are produced by many bacteria to surround their cells, and vary in structural complexity: ranging from a disorganised slime layer of extra-cellular polymer, to a highly structured capsule or glycocalyx. These structures can protect cells from engulfment by eukaryotic cells, such as macrophages. They can also act as antigens and be involved in cell recognition, as well as aiding attachment to surfaces and the formation of biofilms. Certain genera of Gram-positive bacteria, such as Bacillus, Clostridium, Sporohalobacter, Anaerobacter and Heliobacterium, can form highly resistant, dormant structures called endospores. In almost all cases, one endospore is formed and this is not a reproductive process, although Anaerobacter can make up to seven endospores in a single cell. Endospores have a central core of cytoplasm containing DNA and ribosomes surrounded by a cortex layer and protected by an impermeable and rigid coat. Endospores show no detectable metabolism and can survive extreme physical and chemical stresses, such as high levels of UV light, gamma radiation, detergents, disinfectants, heat, freezing, pressure and desiccation. In this dormant state, these organisms may remain viable for millions of years, and endospores even allow bacteria to survive exposure to the vacuum and radiation in space. Endospore-forming bacteria can also cause disease: for example, anthrax can be contracted by the inhalation of Bacillus anthracis endospores, and contamination of deep puncture wounds with Clostridium tetani endospores causes tetanus. Bacteria exhibit an extremely wide variety of metabolic types. The distribution of metabolic traits within a group of bacteria has traditionally been used to define their taxonomy, but these traits often do not correspond with modern genetic classifications. Bacterial metabolism is classified into nutritional groups on the basis of three major criteria: the kind of energy used for growth, the source of carbon, and the electron donors used for growth. An additional criterion of respiratory microorganisms are the electron acceptors used for aerobic or anaerobic respiration. Carbon metabolism in bacteria is either heterotrophic, where organic carbon compounds are used as carbon sources, or autotrophic, meaning that cellular carbon is obtained by fixing carbon dioxide. Heterotrophic bacteria include parasitic types. Typical autotrophic bacteria are phototrophic cyanobacteria, green sulfur-bacteria and some purple bacteria, but also many chemolithotrophic species, such as nitrifying or sulfur-oxidising bacteria. Energy metabolism of bacteria is either based on phototrophy, the use of light through photosynthesis, or on chemotrophy, the use of chemical substances for energy, which are mostly oxidised at the expense of oxygen or alternative electron acceptors (aerobic/anaerobic respiration). Finally, bacteria are further divided into lithotrophs that use inorganic electron donors and organotrophs that use organic compounds as electron donors. Chemotrophic organisms use the respective electron donors for energy conservation (by aerobic/anaerobic respiration or fermentation) and biosynthetic reactions (e.g. carbon dioxide fixation), whereas phototrophic organisms use them only for biosynthetic purposes. Respiratory organisms use chemical compounds as a source of energy by taking electrons from the reduced substrate and transferring them to a terminal electron acceptor in a redox reaction. This reaction releases energy that can be used to synthesise ATP and drive metabolism. In aerobic organisms, oxygen is used as the electron acceptor. In anaerobic organisms other inorganic compounds, such as nitrate, sulfate or carbon dioxide are used as electron acceptors. This leads to the ecologically important processes of denitrification, sulfate reduction and acetogenesis, respectively. Another way of life of chemotrophs in the absence of possible electron acceptors is fermentation, where the electrons taken from the reduced substrates are transferred to oxidised intermediates to generate reduced fermentation products (e.g. lactate, ethanol, hydrogen, butyric acid). Fermentation is possible, because the energy content of the substrates is higher than that of the products, which allows the organisms to synthesise ATP and drive their metabolism. These processes are also important in biological responses to pollution; for example, sulfate-reducing bacteria are largely responsible for the production of the highly toxic forms of mercury (methyl- and dimethylmercury) in the environment. Non-respiratory anaerobes use fermentation to generate energy and reducing power, secreting metabolic by-products (such as ethanol in brewing) as waste. Facultative anaerobes can switch between fermentation and different terminal electron acceptors depending on the environmental conditions in which they find themselves. Lithotrophic bacteria can use inorganic compounds as a source of energy. Common inorganic electron donors are hydrogen, carbon monoxide, ammonia (leading to nitrification), ferrous iron and other reduced metal ions, and several reduced sulfur compounds. Unusually, the gas methane can be used by methanotrophic bacteria as both a source of electrons and a substrate for carbon anabolism. In both aerobic phototrophy and chemolithotrophy, oxygen is used as a terminal electron acceptor, while under anaerobic conditions inorganic compounds are used instead. Most lithotrophic organisms are autotrophic, whereas organotrophic organisms are heterotrophic. In addition to fixing carbon dioxide in photosynthesis, some bacteria also fix nitrogen gas (nitrogen fixation) using the enzyme nitrogenase. This environmentally important trait can be found in bacteria of nearly all the metabolic types listed above, but is not universal. Unlike multicellular organisms, increases in the size of bacteria (cell growth) and their reproduction by cell division are tightly linked in unicellular organisms. Bacteria grow to a fixed size and then reproduce through binary fission, a form of asexual reproduction. Under optimal conditions, bacteria can grow and divide extremely rapidly, and bacterial populations can double as quickly as every 9.8 minutes. In cell division, two identical clone daughter cells are produced. Some bacteria, while still reproducing asexually, form more complex reproductive structures that help disperse the newly formed daughter cells. Examples include fruiting body formation by Myxobacteria and aerial hyphae formation by Streptomyces, or budding. Budding involves a cell forming a protrusion that breaks away and produces a daughter cell. 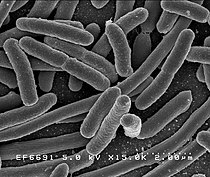 A colony of Escherichia coli. In the laboratory, bacteria are usually grown using solid or liquid media. Solid growth media such as agar plates are used to isolate pure cultures of a bacterial strain. However, liquid growth media are used when measurement of growth or large volumes of cells are required. Growth in stirred liquid media occurs as an even cell suspension, making the cultures easy to divide and transfer, although isolating single bacteria from liquid media is difficult. The use of selective media (media with specific nutrients added or deficient, or with antibiotics added) can help identify specific organisms. Most laboratory techniques for growing bacteria use high levels of nutrients to produce large amounts of cells cheaply and quickly. However, in natural environments nutrients are limited, meaning that bacteria cannot continue to reproduce indefinitely. This nutrient limitation has led the evolution of different growth strategies (see r/K selection theory). Some organisms can grow extremely rapidly when nutrients become available, such as the formation of algal (and cyanobacterial) blooms that often occur in lakes during the summer. Other organisms have adaptations to harsh environments, such as the production of multiple antibiotics by Streptomyces that inhibit the growth of competing microorganisms. In nature, many organisms live in communities (e.g. biofilms) which may allow for increased supply of nutrients and protection from environmental stresses. These relationships can be essential for growth of a particular organism or group of organisms (syntrophy). Bacterial growth follows three phases. When a population of bacteria first enter a high-nutrient environment that allows growth, the cells need to adapt to their new environment. The first phase of growth is the lag phase, a period of slow growth when the cells are adapting to the high-nutrient environment and preparing for fast growth. The lag phase has high biosynthesis rates, as proteins necessary for rapid growth are produced. The second phase of growth is the logarithmic phase (log phase), also known as the exponential phase. The log phase is marked by rapid exponential growth. The rate at which cells grow during this phase is known as the growth rate (k), and the time it takes the cells to double is known as the generation time (g). During log phase, nutrients are metabolised at maximum speed until one of the nutrients is depleted and starts limiting growth. The final phase of growth is the stationary phase and is caused by depleted nutrients. The cells reduce their metabolic activity and consume non-essential cellular proteins. The stationary phase is a transition from rapid growth to a stress response state and there is increased expression of genes involved in DNA repair, antioxidant metabolism and nutrient transport. Most bacteria have a single circular chromosome that can range in size from only 160,000 base pairs in the endosymbiotic bacteria Candidatus Carsonella ruddii, to 12,200,000 base pairs in the soil-dwelling bacteria Sorangium cellulosum. Spirochaetes of the genus Borrelia are a notable exception to this arrangement, with bacteria such as Borrelia burgdorferi, the cause of Lyme disease, containing a single linear chromosome. The genes in bacterial genomes are usually a single continuous stretch of DNA and although several different types of introns do exist in bacteria, these are much more rare than in eukaryotes. Bacteria may also contain plasmids, which are small extra-chromosomal DNAs that may contain genes for antibiotic resistance or virulence factors. Bacteria, as asexual organisms, inherit identical copies of their parent's genes (i.e., they are clonal). However, all bacteria can evolve by selection on changes to their genetic material DNA caused by genetic recombination or mutations. Mutations come from errors made during the replication of DNA or from exposure to mutagens. Mutation rates vary widely among different species of bacteria and even among different clones of a single species of bacteria. Genetic changes in bacterial genomes come from either random mutation during replication or "stress-directed mutation", where genes involved in a particular growth-limiting process have an increased mutation rate. Some bacteria also transfer genetic material between cells. This can occur in three main ways. Firstly, bacteria can take up exogenous DNA from their environment, in a process called transformation. Genes can also be transferred by the process of transduction, when the integration of a bacteriophage introduces foreign DNA into the chromosome. The third method of gene transfer is bacterial conjugation, where DNA is transferred through direct cell contact. This gene acquisition from other bacteria or the environment is called horizontal gene transfer and may be common under natural conditions. Gene transfer is particularly important in antibiotic resistance as it allows the rapid transfer of resistance genes between different pathogens. Bacteriophages are viruses that change the bacterial DNA. Many types of bacteriophage exist, some simply infect and lyse their host bacteria, while others insert into the bacterial chromosome. A bacteriophage can contain genes that contribute to its host's phenotype: for example, in the evolution of Escherichia coli O157:H7 and Clostridium botulinum, the toxin genes in an integrated phage converted a harmless ancestral bacteria into a lethal pathogen. Bacteria resist phage infection through restriction modification systems that degrade foreign DNA, and a system that uses CRISPR sequences to retain fragments of the genomes of phage that the bacteria have come into contact with in the past, which allows them to block virus replication through a form of RNA interference. This CRISPR system provides bacteria with acquired immunity to infection. Bacteria frequently secrete chemicals into their environment in order to modify it favorably. The secretions are often proteins and may act as enzymes that digest some form of food in the environment. Bacteria often function as multicellular aggregates known as biofilms, exchanging a variety of molecular signals for inter-cell communication, and engaging in coordinated multicellular behavior. The communal benefits of multicellular cooperation include a cellular division of labor, accessing resources that cannot effectively be utilized by single cells, collectively defending against antagonists, and optimizing population survival by differentiating into distinct cell types. For example, bacteria in biofilms can have more than 500 times increased resistance to antibacterial agents than individual "planktonic" bacteria of the same species. Many bacteria can move using a variety of mechanisms: flagella are used for swimming through water; bacterial gliding and twitching motility move bacteria across surfaces; and changes of buoyancy allow vertical motion. Flagellum of Gram-negative Bacteria. The base drives the rotation of the hook and filament. Swimming bacteria frequently move near 10 body lengths per second and a few as fast as 100. This makes them at least as fast as fish, on a relative scale. In twitching motility, bacterial use their type IV pili as a grappling hook, repeatedly extending it, anchoring it and then retracting it with remarkable force (>80 pN). Flagella are semi-rigid cylindrical structures that are rotated and function much like the propeller on a ship. Objects as small as bacteria operate a low Reynolds number and cylindrical forms are more efficient than the flat, paddle-like, forms appropriate at human size scale. Bacterial species differ in the number and arrangement of flagella on their surface; some have a single flagellum (monotrichous), a flagellum at each end (amphitrichous), clusters of flagella at the poles of the cell (lophotrichous), while others have flagella distributed over the entire surface of the cell (peritrichous). The bacterial flagella is the best-understood motility structure in any organism and is made of about 20 proteins, with approximately another 30 proteins required for its regulation and assembly. The flagellum is a rotating structure driven by a reversible motor at the base that uses the electrochemical gradient across the membrane for power. This motor drives the motion of the filament, which acts as a propeller. Many bacteria (such as E. coli) have two distinct modes of movement: forward movement (swimming) and tumbling. The tumbling allows them to reorient and makes their movement a three-dimensional random walk. (See external links below for link to videos.) The flagella of a unique group of bacteria, the spirochaetes, are found between two membranes in the periplasmic space. They have a distinctive helical body that twists about as it moves. Motile bacteria are attracted or repelled by certain stimuli in behaviors called taxes: these include chemotaxis, phototaxis and magnetotaxis. In one peculiar group, the myxobacteria, individual bacteria move together to form waves of cells that then differentiate to form fruiting bodies containing spores. The myxobacteria move only when on solid surfaces, unlike E. coli which is motile in liquid or solid media. Several Listeria and Shigella species move inside host cells by usurping the cytoskeleton, which is normally used to move organelles inside the cell. By promoting actin polymerization at one pole of their cells, they can form a kind of tail that pushes them through the host cell's cytoplasm. Classification seeks to describe the diversity of bacterial species by naming and grouping organisms based on similarities. Bacteria can be classified on the basis of cell structure, cellular metabolism or on differences in cell components such as DNA, fatty acids, pigments, antigens and quinones. While these schemes allowed the identification and classification of bacterial strains, it was unclear whether these differences represented variation between distinct species or between strains of the same species. This uncertainty was due to the lack of distinctive structures in most bacteria, as well as lateral gene transfer between unrelated species. Due to lateral gene transfer, some closely related bacteria can have very different morphologies and metabolisms. To overcome this uncertainty, modern bacterial classification emphasizes molecular systematics, using genetic techniques such as guanine cytosine ratio determination, genome-genome hybridization, as well as sequencing genes that have not undergone extensive lateral gene transfer, such as the rRNA gene. Classification of bacteria is determined by publication in the International Journal of Systematic Bacteriology, and Bergey's Manual of Systematic Bacteriology. The International Committee on Systematic Bacteriology (ICSB) maintains international rules for the naming of bacteria and taxonomic categories and for the ranking of them in the International Code of Nomenclature of Bacteria. The term "bacteria" was traditionally applied to all microscopic, single-celled prokaryotes. However, molecular systematics showed prokaryotic life to consist of two separate domains, originally called Eubacteria and Archaebacteria, but now called Bacteria and Archaea that evolved independently from an ancient common ancestor. The archaea and eukaryotes are more closely related to each other than either is to the bacteria. These two domains, along with Eukarya, are the basis of the three-domain system, which is currently the most widely used classification system in microbiolology. However, due to the relatively recent introduction of molecular systematics and a rapid increase in the number of genome sequences that are available, bacterial classification remains a changing and expanding field. For example, a few biologists argue that the Archaea and Eukaryotes evolved from Gram-positive bacteria. Identification of bacteria in the laboratory is particularly relevant in medicine, where the correct treatment is determined by the bacterial species causing an infection. 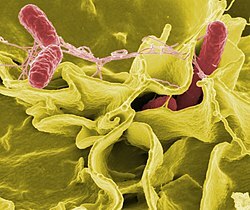 Consequently, the need to identify human pathogens was a major impetus for the development of techniques to identify bacteria. Phylogenetic tree showing the diversity of bacteria, compared to other organisms. Eukaryotes are colored red, archaea green and bacteria blue. The Gram stain, developed in 1884 by Hans Christian Gram, characterises bacteria based on the structural characteristics of their cell walls. The thick layers of peptidoglycan in the "Gram-positive" cell wall stain purple, while the thin "Gram-negative" cell wall appears pink. By combining morphology and Gram-staining, most bacteria can be classified as belonging to one of four groups (Gram-positive cocci, Gram-positive bacilli, Gram-negative cocci and Gram-negative bacilli). Some organisms are best identified by stains other than the Gram stain, particularly mycobacteria or Nocardia, which show acid-fastness on Ziehl'Neelsen or similar stains. Other organisms may need to be identified by their growth in special media, or by other techniques, such as serology. Culture techniques are designed to promote the growth and identify particular bacteria, while restricting the growth of the other bacteria in the sample. Often these techniques are designed for specific specimens; for example, a sputum sample will be treated to identify organisms that cause pneumonia, while stool specimens are cultured on selective media to identify organisms that cause diarrhoea, while preventing growth of non-pathogenic bacteria. Specimens that are normally sterile, such as blood, urine or spinal fluid, are cultured under conditions designed to grow all possible organisms. Once a pathogenic organism has been isolated, it can be further characterised by its morphology, growth patterns such as (aerobic or anaerobic growth, patterns of hemolysis) and staining. As with bacterial classification, identification of bacteria is increasingly using molecular methods. Diagnostics using such DNA-based tools, such as polymerase chain reaction, are increasingly popular due to their specificity and speed, compared to culture-based methods. These methods also allow the detection and identification of "viable but nonculturable" cells that are metabolically active but non-dividing. However, even using these improved methods, the total number of bacterial species is not known and cannot even be estimated with any certainty. Following present classification, there are fewer than 9,000 known species of bacteria (including cyanobacteria), but attempts to estimate the true level of bacterial diversity have ranged from 107 to 109 total species - and even these diverse estimates may be off by many orders of magnitude. Despite their apparent simplicity, bacteria can form complex associations with other organisms. These symbiotic associations can be divided into parasitism, mutualism and commensalism. Due to their small size, commensal bacteria are ubiquitous and grow on animals and plants exactly as they will grow on any other surface. However, their growth can be increased by warmth and sweat, and large populations of these organisms in humans are the cause of body odor. Some species of bacteria kill and then consume other microorganisms, these species called predatory bacteria. These include organisms such as Myxococcus xanthus, which forms swarms of cells that kill and digest any bacteria they encounter. Other bacterial predators either attach to their prey in order to digest them and absorb nutrients, such as Vampirococcus, or invade another cell and multiply inside the cytosol, such as Daptobacter. These predatory bacteria are thought to have evolved from saprophages that consumed dead microorganisms, through adaptations that allowed them to entrap and kill other organisms. Certain bacteria form close spatial associations that are essential for their survival. One such mutualistic association, called interspecies hydrogen transfer, occurs between clusters of anaerobic bacteria that consume organic acids such as butyric acid or propionic acid and produce hydrogen, and methanogenic Archaea that consume hydrogen. The bacteria in this association are unable to consume the organic acids as this reaction produces hydrogen that accumulates in their surroundings. Only the intimate association with the hydrogen-consuming Archaea keeps the hydrogen concentration low enough to allow the bacteria to grow. In soil, microorganisms which reside in the rhizosphere (a zone that includes the root surface and the soil that adheres to the root after gentle shaking) carry out nitrogen fixation, converting nitrogen gas to nitrogenous compounds. This serves to provide an easily absorbable form of nitrogen for many plants, which cannot fix nitrogen themselves. Many other bacteria are found as symbionts in humans and other organisms. For example, the presence of over 1,000 bacterial species in the normal human gut flora of the intestines can contribute to gut immunity, synthesise vitamins such as folic acid, vitamin K and biotin, convert milk protein to lactic acid (see Lactobacillus), as well as fermenting complex undigestible carbohydrates. The presence of this gut flora also inhibits the growth of potentially pathogenic bacteria (usually through competitive exclusion) and these beneficial bacteria are consequently sold as probiotic dietary supplements. Each species of pathogen has a characteristic spectrum of interactions with its human hosts. Some organisms, such as Staphylococcus or Streptococcus, can cause skin infections, pneumonia, meningitis and even overwhelming sepsis, a systemic inflammatory response producing shock, massive vasodilation and death. Yet these organisms are also part of the normal human flora and usually exist on the skin or in the nose without causing any disease at all. Other organisms invariably cause disease in humans, such as the Rickettsia, which are obligate intracellular parasites able to grow and reproduce only within the cells of other organisms. One species of Rickettsia causes typhus, while another causes Rocky Mountain spotted fever. Chlamydia, another phylum of obligate intracellular parasites, contains species that can cause pneumonia, or urinary tract infection and may be involved in coronary heart disease. Finally, some species such as Pseudomonas aeruginosa, Burkholderia cenocepacia, and Mycobacterium avium are opportunistic pathogens and cause disease mainly in people suffering from immunosuppression or cystic fibrosis. Bacterial infections may be treated with antibiotics, which are classified as bacteriocidal if they kill bacteria, or bacteriostatic if they just prevent bacterial growth. There are many types of antibiotics and each class inhibits a process that is different in the pathogen from that found in the host. An example of how antibiotics produce selective toxicity are chloramphenicol and puromycin, which inhibit the bacterial ribosome, but not the structurally different eukaryotic ribosome. Antibiotics are used both in treating human disease and in intensive farming to promote animal growth, where they may be contributing to the rapid development of antibiotic resistance in bacterial populations. Infections can be prevented by antiseptic measures such as sterilizating the skin prior to piercing it with the needle of a syringe, and by proper care of indwelling catheters. Surgical and dental instruments are also sterilized to prevent contamination by bacteria. Disinfectants such as bleach are used to kill bacteria or other pathogens on surfaces to prevent contamination and further reduce the risk of infection. Bacteria, often lactic acid bacteria such as Lactobacillus and Lactococcus, in combination with yeasts and molds, have been used for thousands of years in the preparation of fermented foods such as cheese, pickles, soy sauce, sauerkraut, vinegar, wine and yoghurt. The ability of bacteria to degrade a variety of organic compounds is remarkable and has been used in waste processing and bioremediation. Bacteria capable of digesting the hydrocarbons in petroleum are often used to clean up oil spills. Fertilizer was added to some of the beaches in Prince William Sound in an attempt to promote the growth of these naturally occurring bacteria after the infamous 1989 Exxon Valdez oil spill. These efforts were effective on beaches that were not too thickly covered in oil. Bacteria are also used for the bioremediation of industrial toxic wastes. In the chemical industry, bacteria are most important in the production of enantiomerically pure chemicals for use as pharmaceuticals or agrichemicals. îï¿½. ^ The word bacteria derives from the Greek îï¿½îï¿½îï¿½ï¿½îï¿½Ï�îï¿½î¿îï¿½, baktäï¿½rion, meaning "small staff". ^ "Bacteria (eubacteria)". Taxonomy Browser. NCBI. http://www.ncbi.nlm.nih.gov/Taxonomy/Browser/wwwtax.cgi?mode=Undef&id=2&lvl=3&lin=f&keep=1&srchmode=1&unlock. Retrieved 2008-09-10. ^ Fredrickson JK, Zachara JM, Balkwill DL, et al. (July 2004). "Geomicrobiology of high-level nuclear waste-contaminated vadose sediments at the Hanford site, Washington state". Applied and Environmental Microbiology 70 (7): 4230'41. doi:10.1128/AEM.70.7.4230-4241.2004. PMID 15240306. ^ a b Whitman WB, Coleman DC, Wiebe WJ (June 1998). "Prokaryotes: the unseen majority". Proceedings of the National Academy of Sciences of the United States of America 95 (12): 6578'83. doi:10.1073/pnas.95.12.6578. PMID 9618454. ^ a b RappÃ© MS, Giovannoni SJ (2003). "The uncultured microbial majority". Annual Review of Microbiology 57: 369'94. doi:10.1146/annurev.micro.57.030502.090759. PMID 14527284. ^ Sears CL (October 2005). "A dynamic partnership: celebrating our gut flora". Anaerobe 11 (5): 247'51. doi:10.1016/j.anaerobe.2005.05.001. PMID 16701579. ^ "2002 WHO mortality data". http://www.who.int/healthinfo/bodgbd2002revised/en/index.html. Retrieved 2007-01-20. ^ Ishige T, Honda K, Shimizu S (April 2005). "Whole organism biocatalysis". Current Opinion in Chemical Biology 9 (2): 174'80. doi:10.1016/j.cbpa.2005.02.001. PMID 15811802. ^ a b Woese CR, Kandler O, Wheelis ML (June 1990). "Towards a natural system of organisms: proposal for the domains Archaea, Bacteria, and Eucarya". Proceedings of the National Academy of Sciences of the United States of America 87 (12): 4576'9. doi:10.1073/pnas.87.12.4576. PMID 2112744. ^ Porter JR (June 1976). "Antony van Leeuwenhoek: tercentenary of his discovery of bacteria". Bacteriological Reviews 40 (2): 260'9. PMID 786250. PMC 413956. http://mmbr.asm.org/cgi/pmidlookup?view=long&pmid=786250. ^ van Leeuwenhoek A (1684). "An abstract of a letter from Mr. Anthony Leevvenhoek at Delft, dated Sep. 17, 1683, Containing Some Microscopical Observations, about Animals in the Scurf of the Teeth, the Substance Call'd Worms in the Nose, the Cuticula Consisting of Scales". Philosophical Transactions (1683'1775) 14: 568'574. doi:10.1098/rstl.1684.0030. http://www.journals.royalsoc.ac.uk/content/120136/?k=Sep.+17%2c+1683. Retrieved 2007-08-19. ^ van Leeuwenhoek A (1700). "Part of a Letter from Mr Antony van Leeuwenhoek, concerning the Worms in Sheeps Livers, Gnats, and Animalcula in the Excrements of Frogs". Philosophical Transactions (1683'1775) 22: 509'518. doi:10.1098/rstl.1700.0013. http://www.journals.royalsoc.ac.uk/link.asp?id=4j53731651310230. Retrieved 2007-08-19. ^ van Leeuwenhoek A (1702). "Part of a Letter from Mr Antony van Leeuwenhoek, F. R. S. concerning Green Weeds Growing in Water, and Some Animalcula Found about Them". Philosophical Transactions (1683-1775) 23: 1304'11. doi:10.1098/rstl.1702.0042. http://www.journals.royalsoc.ac.uk/link.asp?id=fl73121jk4150280. Retrieved 2007-08-19. ^ "Etymology of the word "bacteria"". Online Etymology dictionary. http://www.etymonline.com/index.php?term=bacteria. Retrieved 2006-11-23. ^ "Pasteur's Papers on the Germ Theory". LSU Law Center's Medical and Public Health Law Site, Historic Public Health Articles. http://biotech.law.lsu.edu/cphl/history/articles/pasteur.htm#paperII. Retrieved 2006-11-23. ^ "The Nobel Prize in Physiology or Medicine 1905". Nobelprize.org. http://nobelprize.org/nobel_prizes/medicine/laureates/1905/. Retrieved 2006-11-22. ^ O'Brien S, Goedert J (1996). "HIV causes AIDS: Koch's postulates fulfilled". Curr Opin Immunol 8 (5): 613'618. doi:10.1016/S0952-7915(96)80075-6. PMID 8902385. ^ Thurston A (2000). "Of blood, inflammation and gunshot wounds: the history of the control of sepsis". Aust N Z J Surg 70 (12): 855'61. doi:10.1046/j.1440-1622.2000.01983.x. PMID 11167573. ^ Schwartz R (2004). "Paul Ehrlich's magic bullets". N Engl J Med 350 (11): 1079'80. doi:10.1056/NEJMp048021. PMID 15014180. ^ "Biography of Paul Ehrlich". Nobelprize.org. http://nobelprize.org/nobel_prizes/medicine/laureates/1908/ehrlich-bio.html. Retrieved 2006-11-26. ^ Woese C, Fox G (1977). "Phylogenetic structure of the prokaryotic domain: the primary kingdoms". Proc Natl Acad Sci USA 74 (11): 5088'5090. doi:10.1073/pnas.74.11.5088. PMID 270744. ^ Woese CR, Kandler O, Wheelis ML (June 1990). "Towards a natural system of organisms: proposal for the domains Archaea, Bacteria, and Eucarya". Proceedings of the National Academy of Sciences of the United States of America 87 (12): 4576'9. doi:10.1073/pnas.87.12.4576. PMID 2112744. ^ Schopf J (1994). "Disparate rates, differing fates: tempo and mode of evolution changed from the Precambrian to the Phanerozoic". Proc Natl Acad Sci USA 91 (15): 6735'42. doi:10.1073/pnas.91.15.6735. PMID 8041691. ^ DeLong E, Pace N (2001). "Environmental diversity of bacteria and archaea". Syst Biol 50 (4): 470'78. doi:10.1080/106351501750435040. PMID 12116647. ^ Brown JR, Doolittle WF (December 1997). "Archaea and the prokaryote-to-eukaryote transition". Microbiology and Molecular Biology Reviews 61 (4): 456'502. PMID 9409149. PMC 232621. http://mmbr.asm.org/cgi/pmidlookup?view=long&pmid=9409149. ^ Di Giulio M (2003). "The universal ancestor and the ancestor of bacteria were hyperthermophiles". J Mol Evol 57 (6): 721'30. doi:10.1007/s00239-003-2522-6. PMID 14745541. ^ Battistuzzi FU, Feijao A, Hedges SB (November 2004). "A genomic timescale of prokaryote evolution: insights into the origin of methanogenesis, phototrophy, and the colonization of land". BMC Evolutionary Biology 4: 44. doi:10.1186/1471-2148-4-44. PMID 15535883. ^ Poole A, Penny D (2007). "Evaluating hypotheses for the origin of eukaryotes". Bioessays 29 (1): 74'84. doi:10.1002/bies.20516. PMID 17187354. ^ Dyall S, Brown M, Johnson P (2004). "Ancient invasions: from endosymbionts to organelles". Science 304 (5668): 253'7. doi:10.1126/science.1094884. PMID 15073369. ^ Lang B, Gray M, Burger G (1999). "Mitochondrial genome evolution and the origin of eukaryotes". Annu Rev Genet 33: 351'97. doi:10.1146/annurev.genet.33.1.351. PMID 10690412. ^ McFadden G (1999). "Endosymbiosis and evolution of the plant cell". Curr Opin Plant Biol 2 (6): 513'9. doi:10.1016/S1369-5266(99)00025-4. PMID 10607659. ^ Schulz H, Jorgensen B (2001). "Big bacteria". Annu Rev Microbiol 55: 105'37. doi:10.1146/annurev.micro.55.1.105. PMID 11544351. ^ Robertson J, Gomersall M, Gill P. (1975). "Mycoplasma hominis: growth, reproduction, and isolation of small viable cells". J Bacteriol. 124 (2): 1007'18. PMID 1102522. ^ Velimirov, B. (2001). "Nanobacteria, Ultramicrobacteria and Starvation Forms: A Search for the Smallest Metabolizing Bacterium". Microbes and Environments 16 (2): 67'77. doi:10.1264/jsme2.2001.67. http://www.jstage.jst.go.jp/article/jsme2/16/2/67/_pdf. Retrieved 2008-06-23. ^ Dusenbery, David B. (2009). Living at Micro Scale, pp.20-25. Harvard University Press, Cambridge, Mass. ISBN 978-0-674-03116-6. ^ Fritz I, StrÃ¶mpl C, Abraham W (2004). "Phylogenetic relationships of the genera Stella, Labrys and Angulomicrobium within the 'Alphaproteobacteria' and description of Angulomicrobium amanitiforme sp. nov". Int J Syst Evol Microbiol 54 (Pt 3): 651'7. doi:10.1099/ijs.0.02746-0. PMID 15143003. http://ijs.sgmjournals.org/cgi/content/full/54/3/651. ^ Wanger, G; Onstott, TC; Southam, G (2008). "Stars of the terrestrial deep subsurface: A novel `star-shaped' bacterial morphotype from a South African platinum mine". Geobiology 6 (3): 325'330. doi:10.1111/j.1472-4669.2008.00163.x. PMID 18498531. ^ Cabeen M, Jacobs-Wagner C (2005). "Bacterial cell shape". Nat Rev Microbiol 3 (8): 601'10. doi:10.1038/nrmicro1205. PMID 16012516. ^ Young K (2006). "The selective value of bacterial shape". Microbiol Mol Biol Rev 70 (3): 660'703. doi:10.1128/MMBR.00001-06. PMID 16959965. ^ Douwes K, Schmalzbauer E, Linde H, Reisberger E, Fleischer K, Lehn N, Landthaler M, Vogt T (2003). "Branched filaments no fungus, ovoid bodies no bacteria: Two unusual cases of mycetoma". J Am Acad Dermatol 49 (2 Suppl Case Reports): S170'3. doi:10.1067/mjd.2003.302. PMID 12894113. ^ Donlan R (2002). "Biofilms: microbial life on surfaces". Emerg Infect Dis 8 (9): 881'90. PMID 12194761. ^ Branda S, Vik S, Friedman L, Kolter R (2005). "Biofilms: the matrix revisited". Trends Microbiol 13 (1): 20'26. doi:10.1016/j.tim.2004.11.006. PMID 15639628. ^ a b Davey M, O'toole G (2000). "Microbial biofilms: from ecology to molecular genetics". Microbiol Mol Biol Rev 64 (4): 847'67. doi:10.1128/MMBR.64.4.847-867.2000. PMID 11104821. ^ Donlan RM, Costerton JW (2002). "Biofilms: survival mechanisms of clinically relevant microorganisms". Clin Microbiol Rev 15 (2): 167'93. doi:10.1128/CMR.15.2.167-193.2002. PMID 11932229. ^ Shimkets L (1999). "Intercellular signaling during fruiting-body development of Myxococcus xanthus". Annu Rev Microbiol 53: 525'49. doi:10.1146/annurev.micro.53.1.525. PMID 10547700. ^ a b Kaiser D (2004). "Signaling in myxobacteria". Annu Rev Microbiol 58: 75'98. doi:10.1146/annurev.micro.58.030603.123620. PMID 15487930. ^ Berg JM, Tymoczko JL Stryer L (2002). Molecular Cell Biology (5th ed.). WH Freeman. ISBN 0-7167-4955-6. ^ Gitai Z (2005). "The new bacterial cell biology: moving parts and subcellular architecture". Cell 120 (5): 577'86. doi:10.1016/j.cell.2005.02.026. PMID 15766522. ^ Shih YL, Rothfield L (September 2006). "The bacterial cytoskeleton". Microbiology and Molecular Biology Reviews 70 (3): 729'54. doi:10.1128/MMBR.00017-06. PMID 16959967. ^ Gitai Z (March 2005). "The new bacterial cell biology: moving parts and subcellular architecture". Cell 120 (5): 577'86. doi:10.1016/j.cell.2005.02.026. PMID 15766522. ^ Norris V, den Blaauwen T, Cabin-Flaman A, et al. (March 2007). "Functional taxonomy of bacterial hyperstructures". Microbiology and Molecular Biology Reviews 71 (1): 230'53. doi:10.1128/MMBR.00035-06. PMID 17347523. PMC 1847379. http://mmbr.asm.org/cgi/pmidlookup?view=long&pmid=17347523. ^ Kerfeld CA, Sawaya MR, Tanaka S, et al. (August 2005). "Protein structures forming the shell of primitive bacterial organelles". Science (journal) 309 (5736): 936'8. doi:10.1126/science.1113397. PMID 16081736. ^ Bobik, T. A. (2007). "Bacterial Microcompartments" (PDF). Microbe (Am Soc Microbiol) 2: 25'31. http://www.asm.org/ASM/files/ccLibraryFiles/Filename/000000002765/znw00107000025.pdf. ^ Bobik, TA (2006). "Polyhedral organelles compartmenting bacterial metabolic processes" (PDF). Applied Microbiology and Biotechnology 70 (5): 517'525. doi:10.1007/s00253-005-0295-0. PMID 16525780. http://www.springerlink.com/index/EM21R3556222521H.pdf. ^ Yeates TO, Kerfeld CA, Heinhorst S, Cannon GC, Shively JM (August 2008). "Protein-based organelles in bacteria: carboxysomes and related microcompartments". Nat. Rev. Microbiol. 6 (9): 681'691. doi:10.1038/nrmicro1913. PMID 18679172. ^ Harold FM (June 1972). "Conservation and transformation of energy by bacterial membranes". Bacteriological Reviews 36 (2): 172'230. PMID 4261111. PMC 408323. http://mmbr.asm.org/cgi/pmidlookup?view=long&pmid=4261111. ^ Bryant, DA; Frigaard, NU (2006). "Prokaryotic photosynthesis and phototrophy illuminated". Trends Microbiol. 14 (11): 488. doi:10.1016/j.tim.2006.09.001. PMID 16997562. ^ PsencÃ­k J, Ikonen TP, LaurinmÃ¤ki P, et al. (August 2004). "Lamellar organization of pigments in chlorosomes, the light harvesting complexes of green photosynthetic bacteria". Biophys. J. 87 (2): 1165'72. doi:10.1529/biophysj.104.040956. PMID 15298919. PMC 1304455. http://www.biophysj.org/cgi/pmidlookup?view=long&pmid=15298919. ^ Tanaka S, Kerfeld CA, Sawaya MR, et al. (February 2008). "Atomic-level models of the bacterial carboxysome shell". Science (journal) 319 (5866): 1083'6. doi:10.1126/science.1151458. PMID 18292340. ^ Thanbichler M, Wang S, Shapiro L (2005). "The bacterial nucleoid: a highly organized and dynamic structure". J Cell Biochem 96 (3): 506'21. doi:10.1002/jcb.20519. PMID 15988757. ^ Fuerst J (2005). "Intracellular compartmentation in planctomycetes". Annu Rev Microbiol 59: 299'328. doi:10.1146/annurev.micro.59.030804.121258. PMID 15910279. ^ Poehlsgaard J, Douthwaite S (2005). "The bacterial ribosome as a target for antibiotics". Nat Rev Microbiol 3 (11): 870'81. doi:10.1038/nrmicro1265. PMID 16261170. ^ Yeo M, Chater K (2005). "The interplay of glycogen metabolism and differentiation provides an insight into the developmental biology of Streptomyces coelicolor". Microbiology 151 (Pt 3): 855'61. doi:10.1099/mic.0.27428-0. PMID 15758231. http://mic.sgmjournals.org/cgi/content/full/151/3/855?view=long&pmid=15758231. ^ Shiba T, Tsutsumi K, Ishige K, Noguchi T (2000). "Inorganic polyphosphate and polyphosphate kinase: their novel biological functions and applications". Biochemistry (Mosc) 65 (3): 315'23. PMID 10739474. http://protein.bio.msu.ru/biokhimiya/contents/v65/full/65030375.html. ^ Brune DC (June 1995). "Isolation and characterization of sulfur globule proteins from Chromatium vinosum and Thiocapsa roseopersicina". Archives of Microbiology 163 (6): 391'9. doi:10.1007/BF00272127. PMID 7575095. ^ Kadouri D, Jurkevitch E, Okon Y, Castro-Sowinski S (2005). "Ecological and agricultural significance of bacterial polyhydroxyalkanoates". Critical Reviews in Microbiology 31 (2): 55'67. doi:10.1080/10408410590899228. PMID 15986831. ^ Walsby AE (March 1994). "Gas vesicles". Microbiological Reviews 58 (1): 94'144. PMID 8177173. PMC 372955. http://mmbr.asm.org/cgi/pmidlookup?view=long&pmid=8177173. ^ van Heijenoort J (2001). "Formation of the glycan chains in the synthesis of bacterial peptidoglycan". Glycobiology 11 (3): 25R'36R. doi:10.1093/glycob/11.3.25R. PMID 11320055. http://glycob.oxfordjournals.org/cgi/content/full/11/3/25R. ^ a b Koch A (2003). "Bacterial wall as target for attack: past, present, and future research". Clin Microbiol Rev 16 (4): 673'87. doi:10.1128/CMR.16.4.673-687.2003. PMID 14557293. PMC 207114. http://cmr.asm.org/cgi/content/full/16/4/673?view=long&pmid=14557293. ^ a b Gram, HC (1884). "Ãœber die isolierte FÃ¤rbung der Schizomyceten in Schnitt- und TrockenprÃ¤paraten". Fortschr. Med. 2: 185'189. ^ Hugenholtz P (2002). "Exploring prokaryotic diversity in the genomic era". Genome Biology 3 (2): REVIEWS0003. doi:10.1186/gb-2002-3-2-reviews0003. PMID 11864374. PMC 139013. http://genomebiology.com/1465-6906/3/REVIEWS0003. ^ Walsh F, Amyes S (2004). "Microbiology and drug resistance mechanisms of fully resistant pathogens". Curr Opin Microbiol 7 (5): 439'44. doi:10.1016/j.mib.2004.08.007. PMID 15451497. ^ Engelhardt H, Peters J (1998). "Structural research on surface layers: a focus on stability, surface layer homology domains, and surface layer-cell wall interactions". J Struct Biol 124 (2'3): 276'302. doi:10.1006/jsbi.1998.4070. PMID 10049812. ^ Beveridge T, Pouwels P, Sï¿½¡ra M, Kotiranta A, Lounatmaa K, Kari K, Kerosuo E, Haapasalo M, Egelseer E, Schocher I, Sleytr U, Morelli L, Callegari M, Nomellini J, Bingle W, Smit J, Leibovitz E, Lemaire M, Miras I, Salamitou S, BÃ©guin P, Ohayon H, Gounon P, Matuschek M, Koval S (1997). "Functions of S-layers". FEMS Microbiol Rev 20 (1'2): 99'149. PMID 9276929. ^ Kojima S, Blair D (2004). "The bacterial flagellar motor: structure and function of a complex molecular machine". Int Rev Cytol 233: 93'134. doi:10.1016/S0074-7696(04)33003-2. PMID 15037363. ^ Beachey E (1981). "Bacterial adherence: adhesin-receptor interactions mediating the attachment of bacteria to mucosal surface". J Infect Dis 143 (3): 325'45. PMID 7014727. ^ Silverman P (1997). "Towards a structural biology of bacterial conjugation". Mol Microbiol 23 (3): 423'9. doi:10.1046/j.1365-2958.1997.2411604.x. PMID 9044277. ^ Stokes R, Norris-Jones R, Brooks D, Beveridge T, Doxsee D, Thorson L (2004). "The glycan-rich outer layer of the cell wall of Mycobacterium tuberculosis acts as an antiphagocytic capsule limiting the association of the bacterium with macrophages". Infect Immun 72 (10): 5676'86. doi:10.1128/IAI.72.10.5676-5686.2004. PMID 15385466. PMC 517526. http://iai.asm.org/cgi/content/full/72/10/5676?view=long&pmid=15385466. ^ DaffÃ© M, Etienne G (1999). "The capsule of Mycobacterium tuberculosis and its implications for pathogenicity". Tuber Lung Dis 79 (3): 153'69. doi:10.1054/tuld.1998.0200. PMID 10656114. ^ Finlay BB, Falkow S (June 1997). "Common themes in microbial pathogenicity revisited". Microbiology and Molecular Biology Reviews 61 (2): 136'69. PMID 9184008. PMC 232605. http://mmbr.asm.org/cgi/pmidlookup?view=long&pmid=9184008. ^ Nicholson WL, Munakata N, Horneck G, Melosh HJ, Setlow P (September 2000). "Resistance of Bacillus endospores to extreme terrestrial and extraterrestrial environments". Microbiology and Molecular Biology Reviews 64 (3): 548'72. doi:10.1128/MMBR.64.3.548-572.2000. PMID 10974126. PMC 99004. http://mmbr.asm.org/cgi/pmidlookup?view=long&pmid=10974126. ^ Siunov A, Nikitin D, Suzina N, Dmitriev V, Kuzmin N, Duda V (1999). "Phylogenetic status of Anaerobacter polyendosporus, an anaerobic, polysporogenic bacterium" (PDF). Int J Syst Bacteriol 49 Pt 3: 1119'24. PMID 10425769. http://ijs.sgmjournals.org/cgi/reprint/49/3/1119.pdf. ^ Nicholson W, Fajardo-Cavazos P, Rebeil R, Slieman T, Riesenman P, Law J, Xue Y (2002). "Bacterial endospores and their significance in stress resistance". Antonie Van Leeuwenhoek 81 (1'4): 27'32. doi:10.1023/A:1020561122764. PMID 12448702. ^ Vreeland R, Rosenzweig W, Powers D (2000). "Isolation of a 250 million-year-old halotolerant bacterium from a primary salt crystal". Nature 407 (6806): 897'900. doi:10.1038/35038060. PMID 11057666. ^ Cano R, Borucki M (1995). "Revival and identification of bacterial spores in 25- to 40-million-year-old Dominican amber". Science 268 (5213): 1060'4. doi:10.1126/science.7538699. PMID 7538699. ^ Nicholson W, Schuerger A, Setlow P (2005). "The solar UV environment and bacterial spore UV resistance: considerations for Earth-to-Mars transport by natural processes and human spaceflight". Mutat Res 571 (1'2): 249'64. doi:10.1016/j.mrfmmm.2004.10.012. PMID 15748651. ^ Hatheway CL (January 1990). "Toxigenic clostridia". Clinical Microbiology Reviews 3 (1): 66'98. PMID 2404569. PMC 358141. http://cmr.asm.org/cgi/pmidlookup?view=long&pmid=2404569. ^ Nealson K (1999). "Post-Viking microbiology: new approaches, new data, new insights". Orig Life Evol Biosph 29 (1): 73'93. doi:10.1023/A:1006515817767. PMID 11536899. ^ Xu J (2006). "Microbial ecology in the age of genomics and metagenomics: concepts, tools, and recent advances". Mol Ecol 15 (7): 1713'31. doi:10.1111/j.1365-294X.2006.02882.x. PMID 16689892. ^ Zillig W (1991). "Comparative biochemistry of Archaea and Bacteria". Curr Opin Genet Dev 1 (4): 544'51. doi:10.1016/S0959-437X(05)80206-0. PMID 1822288. ^ Hellingwerf K, Crielaard W, Hoff W, Matthijs H, Mur L, van Rotterdam B (1994). "Photobiology of bacteria". Antonie Van Leeuwenhoek 65 (4): 331'47. doi:10.1007/BF00872217. PMID 7832590. ^ Zumft W (1 December 1997). "Cell biology and molecular basis of denitrification". Microbiol Mol Biol Rev 61 (4): 533'616. PMID 9409151. PMC 232623. http://mmbr.asm.org/cgi/reprint/61/4/533?view=long&pmid=9409151. ^ Drake H, Daniel S, KÃ¼sel K, Matthies C, Kuhner C, Braus-Stromeyer S (1997). "Acetogenic bacteria: what are the in situ consequences of their diverse metabolic versatilities?". Biofactors 6 (1): 13'24. doi:10.1002/biof.5520060103. PMID 9233536. ^ Morel, FMM; Kraepiel AML, Amyot M (1998). "The chemical cycle and bioaccumulation of mercury". Annual Review of Ecological Systems 29: 543'566. doi:10.1146/annurev.ecolsys.29.1.543. ^ Dalton H (2005). "The Leeuwenhoek Lecture 2000 the natural and unnatural history of methane-oxidizing bacteria". Philos Trans R Soc Lond B Biol Sci 360 (1458): 1207'22. doi:10.1098/rstb.2005.1657. PMID 16147517. PMC 1569495. http://www.journals.royalsoc.ac.uk/content/yl6umjthf30e4a59/. ^ Zehr J, Jenkins B, Short S, Steward G (2003). "Nitrogenase gene diversity and microbial community structure: a cross-system comparison". Environ Microbiol 5 (7): 539'54. doi:10.1046/j.1462-2920.2003.00451.x. PMID 12823187. ^ Koch A (2002). "Control of the bacterial cell cycle by cytoplasmic growth". Crit Rev Microbiol 28 (1): 61'77. doi:10.1080/1040-840291046696. PMID 12003041. ^ Eagon RG (April 1962). "Pseudomonas natriegens, a marine bacterium with a generation time of less than 10 minutes". Journal of Bacteriology 83 (4): 736'7. PMID 13888946. PMC 279347. http://jb.asm.org/cgi/pmidlookup?view=long&pmid=13888946. ^ Stewart EJ, Madden R, Paul G, Taddei F (2005). "Aging and death in an organism that reproduces by morphologically symmetric division". PLoS Biol. 3 (2): e45. doi:10.1371/journal.pbio.0030045. PMID 15685293. ^ a b c Thomson R, Bertram H (2001). "Laboratory diagnosis of central nervous system infections". Infectious Disease Clinics of North America 15 (4): 1047'71. doi:10.1016/S0891-5520(05)70186-0. PMID 11780267. ^ Paerl H, Fulton R, Moisander P, Dyble J (2001). "Harmful freshwater algal blooms, with an emphasis on cyanobacteria". ScientificWorldJournal 1: 76'113. doi:10.1100/tsw.2001.16. PMID 12805693. ^ Challis G, Hopwood D (2003). "Synergy and contingency as driving forces for the evolution of multiple secondary metabolite production by Streptomyces species". Proc Natl Acad Sci USA 100 Suppl 2: 14555'61. doi:10.1073/pnas.1934677100. PMID 12970466. PMC 304118. http://www.pnas.org/cgi/content/full/100/suppl_2/14555. ^ Kooijman S, Auger P, Poggiale J, Kooi B (2003). "Quantitative steps in symbiogenesis and the evolution of homeostasis". Biol Rev Camb Philos Soc 78 (3): 435'63. doi:10.1017/S1464793102006127. PMID 14558592. ^ Prats C, LÃ³pez D, GirÃ³ A, Ferrer J, Valls J (2006). "Individual-based modelling of bacterial cultures to study the microscopic causes of the lag phase". J Theor Biol 241 (4): 939'53. doi:10.1016/j.jtbi.2006.01.029. PMID 16524598. ^ Hecker M, VÃ¶lker U (2001). "General stress response of Bacillus subtilis and other bacteria". Adv Microb Physiol 44: 35'91. doi:10.1016/S0065-2911(01)44011-2. PMID 11407115. ^ Nakabachi A, Yamashita A, Toh H, Ishikawa H, Dunbar H, Moran N, Hattori M (2006). "The 160-kilobase genome of the bacterial endosymbiont Carsonella". Science 314 (5797): 267. doi:10.1126/science.1134196. PMID 17038615. ^ Pradella S, Hans A, SprÃ¶er C, Reichenbach H, Gerth K, Beyer S (2002). "Characterisation, genome size and genetic manipulation of the myxobacterium Sorangium cellulosum So ce56". Arch Microbiol 178 (6): 484'92. doi:10.1007/s00203-002-0479-2. PMID 12420170. ^ Hinnebusch J, Tilly K (1993). "Linear plasmids and chromosomes in bacteria". Mol Microbiol 10 (5): 917'22. doi:10.1111/j.1365-2958.1993.tb00963.x. PMID 7934868. ^ Belfort M, Reaban ME, Coetzee T, Dalgaard JZ (1 July 1995). "Prokaryotic introns and inteins: a panoply of form and function". J. Bacteriol. 177 (14): 3897'903. PMID 7608058. PMC 177115. http://jb.asm.org/cgi/pmidlookup?view=long&pmid=7608058. ^ Denamur E, Matic I (2006). "Evolution of mutation rates in bacteria". Mol Microbiol 60 (4): 820'7. doi:10.1111/j.1365-2958.2006.05150.x. PMID 16677295. ^ Wright B (2004). "Stress-directed adaptive mutations and evolution". Mol Microbiol 52 (3): 643'50. doi:10.1111/j.1365-2958.2004.04012.x. PMID 15101972. ^ Davison J (1999). "Genetic exchange between bacteria in the environment". Plasmid 42 (2): 73'91. doi:10.1006/plas.1999.1421. PMID 10489325. ^ Hastings P, Rosenberg S, Slack A (2004). "Antibiotic-induced lateral transfer of antibiotic resistance". Trends Microbiol 12 (9): 401'4. doi:10.1016/j.tim.2004.07.003. PMID 15337159. ^ BrÃ¼ssow H, Canchaya C, Hardt WD (September 2004). "Phages and the evolution of bacterial pathogens: from genomic rearrangements to lysogenic conversion". Microbiology and Molecular Biology Reviews 68 (3): 560'602. doi:10.1128/MMBR.68.3.560-602.2004. PMID 15353570. ^ Bickle TA, KrÃ¼ger DH (1 June 1993). "Biology of DNA restriction". Microbiol. Rev. 57 (2): 434'50. PMID 8336674. PMC 372918. http://mmbr.asm.org/cgi/pmidlookup?view=long&pmid=8336674. ^ Barrangou R, Fremaux C, Deveau H, et al. (March 2007). "CRISPR provides acquired resistance against viruses in prokaryotes". Science (journal) 315 (5819): 1709'12. doi:10.1126/science.1138140. PMID 17379808. ^ Brouns SJ, Jore MM, Lundgren M, et al. (August 2008). "Small CRISPR RNAs guide antiviral defense in prokaryotes". Science (journal) 321 (5891): 960'4. doi:10.1126/science.1159689. PMID 18703739. ^ a b Shapiro JA (1998). "Thinking about bacterial populations as multicellular organisms". Annu. Rev. Microbiol. 52: 81'104. doi:10.1146/annurev.micro.52.1.81. PMID 9891794. http://www.sci.uidaho.edu/newton/math501/Sp05/Shapiro.pdf. ^ a b Costerton JW, Lewandowski Z, Caldwell DE, Korber DR, Lappin-Scott HM (1995). "Microbial biofilms". Annu. Rev. Microbiol. 49: 711'45. doi:10.1146/annurev.mi.49.100195.003431. PMID 8561477. http://www.ncbi.nlm.nih.gov/pubmed/8561477. ^ a b c Bardy S, Ng S, Jarrell K (2003). "Prokaryotic motility structures". Microbiology 149 (Pt 2): 295'304. doi:10.1099/mic.0.25948-0. PMID 12624192. http://mic.sgmjournals.org/cgi/content/full/149/2/295?view=long&pmid=12624192. ^ Merz A, So M, Sheetz M (2000). "Pilus retraction powers bacterial twitching motility". Nature 407 (6800): 98'102. doi:10.1038/35024105. PMID 10993081. ^ Macnab RM (1 December 1999). "The bacterial flagellum: reversible rotary propellor and type III export apparatus". J. Bacteriol. 181 (23): 7149'53. PMID 10572114. PMC 103673. http://jb.asm.org/cgi/pmidlookup?view=long&pmid=10572114. ^ Wu M, Roberts J, Kim S, Koch D, DeLisa M (2006). "Collective bacterial dynamics revealed using a three-dimensional population-scale defocused particle tracking technique". Appl Environ Microbiol 72 (7): 4987'94. doi:10.1128/AEM.00158-06. PMID 16820497. PMC 1489374. http://aem.asm.org/cgi/content/full/72/7/4987?view=long&pmid=16820497. ^ Lux R, Shi W (2004). "Chemotaxis-guided movements in bacteria". Crit Rev Oral Biol Med 15 (4): 207'20. doi:10.1177/154411130401500404. PMID 15284186. ^ Frankel R, Bazylinski D, Johnson M, Taylor B (1997). "Magneto-aerotaxis in marine coccoid bacteria". Biophys J 73 (2): 994'1000. doi:10.1016/S0006-3495(97)78132-3. PMID 9251816. ^ Goldberg MB (2001). "Actin-based motility of intracellular microbial pathogens". Microbiol Mol Biol Rev 65 (4): 595'626. doi:10.1128/MMBR.65.4.595-626.2001. PMID 11729265. ^ Boucher Y, Douady CJ, Papke RT, Walsh DA, Boudreau ME, Nesbo CL, Case RJ, Doolittle WF (2003). "Lateral gene transfer and the origins of prokaryotic groups". Annu Rev Genet 37: 283'328. doi:10.1146/annurev.genet.37.050503.084247. PMID 14616063. http://arjournals.annualreviews.org/doi/abs/10.1146/annurev.genet.37.050503.084247. ^ Olsen GJ, Woese CR, Overbeek R (January 1994). "The winds of (evolutionary) change: breathing new life into microbiology". Journal of Bacteriology 176 (1): 1'6. PMID 8282683. PMC 205007. http://jb.asm.org/cgi/pmidlookup?view=long&pmid=8282683. ^ Gupta R (2000). "The natural evolutionary relationships among prokaryotes". Crit Rev Microbiol 26 (2): 111'31. doi:10.1080/10408410091154219. PMID 10890353. ^ Doolittle RF (2005). "Evolutionary aspects of whole-genome biology". Curr Opin Struct Biol 15 (3): 248'253. doi:10.1016/j.sbi.2005.04.001. PMID 11837318. ^ Cavalier-Smith T (2002). "The neomuran origin of archaebacteria, the negibacterial root of the universal tree and bacterial megaclassification". Int J Syst Evol Microbiol 52 (Pt 1): 7'76. PMID 11837318. ^ Ciccarelli FD, Doerks T, von Mering C, Creevey CJ, Snel B, Bork P (2006). "Toward automatic reconstruction of a highly resolved tree of life". Science 311 (5765): 1283'7. doi:10.1126/science.1123061. PMID 16513982. ^ Woods GL, Walker DH (July 1996). "Detection of infection or infectious agents by use of cytologic and histologic stains". Clinical Microbiology Reviews 9 (3): 382'404. PMID 8809467. PMC 172900. http://cmr.asm.org/cgi/pmidlookup?view=long&pmid=8809467. ^ Weinstein M (1994). "Clinical importance of blood cultures". Clin Lab Med 14 (1): 9'16. PMID 8181237. ^ Louie M, Louie L, Simor AE (8 August 2000). "The role of DNA amplification technology in the diagnosis of infectious diseases". CMAJ 163 (3): 301'309. PMID 10951731. PMC 80298. http://www.cmaj.ca/cgi/content/full/163/3/301. ^ Oliver J (2005). "The viable but nonculturable state in bacteria". J Microbiol 43 Spec No: 93'100. PMID 15765062. http://www.msk.or.kr/jsp/view_old_journalD.jsp?paperSeq=2134. ^ Curtis TP, Sloan WT, Scannell JW (August 2002). "Estimating prokaryotic diversity and its limits". Proceedings of the National Academy of Sciences of the United States of America 99 (16): 10494'9. doi:10.1073/pnas.142680199. PMID 12097644. ^ Schloss PD, Handelsman J (December 2004). "Status of the microbial census". Microbiology and Molecular Biology Reviews 68 (4): 686'91. doi:10.1128/MMBR.68.4.686-691.2004. PMID 15590780. ^ Martin MO (September 2002). "Predatory prokaryotes: an emerging research opportunity". Journal of Microbiology and Biotechnology 4 (5): 467'77. PMID 12432957. ^ Velicer GJ, Stredwick KL (August 2002). "Experimental social evolution with Myxococcus xanthus". Antonie Van Leeuwenhoek 81 (1-4): 155'64. doi:10.1023/A:1020546130033. PMID 12448714. ^ Guerrero R, Pedros-Alio C, Esteve I, Mas J, Chase D, Margulis L (April 1986). "Predatory prokaryotes: predation and primary consumption evolved in bacteria". Proc. Natl. Acad. Sci. U.S.A. 83: 2138'42. doi:10.1073/pnas.83.7.2138. PMID 11542073. PMC 323246. http://www.pnas.org/cgi/pmidlookup?view=long&pmid=11542073. ^ Velicer, GJ; Mendes-Soares, H (January 2009). "Bacterial predators". Current Biology 19 (2): R55'R56. doi:10.1016/j.cub.2008.10.043. PMID 19174136. ^ Stams A, de Bok F, Plugge C, van Eekert M, Dolfing J, Schraa G (2006). "Exocellular electron transfer in anaerobic microbial communities". Environ Microbiol 8 (3): 371'82. doi:10.1111/j.1462-2920.2006.00989.x. PMID 16478444. ^ Barea J, Pozo M, AzcÃ³n R, AzcÃ³n-Aguilar C (2005). "Microbial co-operation in the rhizosphere". J Exp Bot 56 (417): 1761'78. doi:10.1093/jxb/eri197. PMID 15911555. http://jxb.oxfordjournals.org/cgi/content/full/56/417/1761. ^ O'Hara A, Shanahan F (2006). "The gut flora as a forgotten organ". EMBO Rep 7 (7): 688'93. doi:10.1038/sj.embor.7400731. PMID 16819463. ^ Zoetendal E, Vaughan E, de Vos W (2006). "A microbial world within us". Mol Microbiol 59 (6): 1639'50. doi:10.1111/j.1365-2958.2006.05056.x. PMID 16553872. ^ Gorbach S (1990). "Lactic acid bacteria and human health". Ann Med 22 (1): 37'41. doi:10.3109/07853899009147239. PMID 2109988. ^ Salminen S, Gueimonde M, Isolauri E (1 May 2005). "Probiotics that modify disease risk". J Nutr 135 (5): 1294'8. PMID 15867327. http://jn.nutrition.org/cgi/content/full/135/5/1294. ^ Fish D (2002). "Optimal antimicrobial therapy for sepsis". Am J Health Syst Pharm 59 Suppl 1: S13'9. PMID 11885408. ^ Belland R, Ouellette S, Gieffers J, Byrne G (2004). "Chlamydia pneumoniae and atherosclerosis". Cell Microbiol 6 (2): 117'27. doi:10.1046/j.1462-5822.2003.00352.x. PMID 14706098. ^ Heise ER (February 1982). "Diseases associated with immunosuppression". Environmental Health Perspectives 43: 9'19. doi:10.2307/3429162. PMID 7037390. PMC 1568899. http://jstor.org/stable/3429162. ^ Saiman L (2004). "Microbiology of early CF lung disease". Paediatric Respiratory Reviews 5 Suppl A: S367'9. PMID 14980298. ^ Fisher, Bruce; Harvey, Richard P.; Champe, Pamela C. (2007). Lippincott's Illustrated Reviews: Microbiology (Lippincott's Illustrated Reviews Series). Hagerstwon, MD: Lippincott Williams & Wilkins. pp. Chapter 33, pages 367'392. ISBN 0-7817-8215-5. ^ Yonath A, Bashan A (2004). "Ribosomal crystallography: initiation, peptide bond formation, and amino acid polymerization are hampered by antibiotics". Annu Rev Microbiol 58: 233'51. doi:10.1146/annurev.micro.58.030603.123822. PMID 15487937. ^ Khachatourians GG (November 1998). "Agricultural use of antibiotics and the evolution and transfer of antibiotic-resistant bacteria". CMAJ 159 (9): 1129'36. PMID 9835883. PMC 1229782. http://www.cmaj.ca/cgi/pmidlookup?view=reprint&pmid=9835883. ^ Johnson M, Lucey J (2006). "Major technological advances and trends in cheese". J Dairy Sci 89 (4): 1174'8. doi:10.3168/jds.S0022-0302(06)72186-5. PMID 16537950. ^ Hagedorn S, Kaphammer B (1994). "Microbial biocatalysis in the generation of flavor and fragrance chemicals". Annu. Rev. Microbiol. 48: 773'800. doi:10.1146/annurev.mi.48.100194.004013. PMID 7826026. ^ Cohen Y (2002). "Bioremediation of oil by marine microbial mats". Int Microbiol 5 (4): 189'93. doi:10.1007/s10123-002-0089-5. PMID 12497184. ^ Neves LC, Miyamura TT, Moraes DA, Penna TC, Converti A (2006). "Biofiltration methods for the removal of phenolic residues". Appl. Biochem. Biotechnol. 129-132: 130'52. doi:10.1385/ABAB:129:1:130. PMID 16915636. ^ Liese A, Filho M (1999). "Production of fine chemicals using biocatalysis". Curr Opin Biotechnol 10 (6): 595'603. doi:10.1016/S0958-1669(99)00040-3. PMID 10600695. ^ Aronson AI, Shai Y (2001). "Why Bacillus thuringiensis insecticidal toxins are so effective: unique features of their mode of action". FEMS Microbiol. Lett. 195 (1): 1'8. doi:10.1111/j.1574-6968.2001.tb10489.x. PMID 11166987. ^ Bozsik A (2006). "Susceptibility of adult Coccinella septempunctata (Coleoptera: Coccinellidae) to insecticides with different modes of action". Pest Manag Sci 62 (7): 651'4. doi:10.1002/ps.1221. PMID 16649191. ^ Chattopadhyay A, Bhatnagar N, Bhatnagar R (2004). "Bacterial insecticidal toxins". Crit Rev Microbiol 30 (1): 33'54. doi:10.1080/10408410490270712. PMID 15116762. ^ Serres MH, Gopal S, Nahum LA, Liang P, Gaasterland T, Riley M (2001). "A functional update of the Escherichia coli K-12 genome". Genome Biology 2 (9): RESEARCH0035. doi:10.1186/gb-2001-2-9-research0035. PMID 11574054. PMC 56896. http://genomebiology.com/1465-6906/2/RESEARCH0035. ^ Almaas E, Kovï¿½¡cs B, Vicsek T, Oltvai Z, Barabï¿½¡si A (2004). "Global organization of metabolic fluxes in the bacterium Escherichia coli". Nature 427 (6977): 839'43. doi:10.1038/nature02289. PMID 14985762. ^ Reed JL, Vo TD, Schilling CH, Palsson BO (2003). "An expanded genome-scale model of Escherichia coli K-12 (iJR904 GSM/GPR)". Genome Biol. 4 (9): R54. doi:10.1186/gb-2003-4-9-r54. PMID 12952533. ^ Walsh G (2005). "Therapeutic insulins and their large-scale manufacture". Appl Microbiol Biotechnol 67 (2): 151'9. doi:10.1007/s00253-004-1809-x. PMID 15580495. ^ Graumann K, Premstaller A (2006). "Manufacturing of recombinant therapeutic proteins in microbial systems". Biotechnol J 1 (2): 164'86. doi:10.1002/biot.200500051. PMID 16892246. Hugenholtz P, Goebel BM, Pace NR (15 September 1998). "Impact of culture-independent studies on the emerging phylogenetic view of bacterial diversity". J Bacteriol 180 (18): 4765'74. PMID 9733676. PMC 107498. http://jb.asm.org/cgi/content/full/180/18/4765?view=full&pmid=9733676. Shively, Jessup M. (2006). Complex Intracellular Structures in Prokaryotes (Microbiology Monographs). Berlin: Springer. ISBN 3-540-32524-7. Witzany G, (2008). "Bio-Communication of Bacteria and their Evolutionary Roots in Natural Genome Editing Competences of Viruses". Open Evol J 2: 44'54. doi:10.2174/1874404400802010044. Bacterial Chemotaxis Interactive Simulator - A web-app that uses several simple algorithms to simulate bacterial chemotaxis.